And now, what you’ve all been waiting for… my first giveaway! I’m so thankful to all the educators out there who do so much good for society. And when I say “educator,” I mean parents, home school instructors, teachers and anyone else who helps shape the lives of upcoming generations. Your efforts are under-appreciated by some, but not by me! THANK YOU FOR ALL YOU DO! The Prize: The prize is a collection of four Scholastic Little Leveled Readers. They’re perfect for PreK-2nd grade. The prize includes one of each book pictured above. They are each a different level (A, B, C, D) and increase slightly in difficulty as the reader progresses through the levels. Books are new and unused. This giveaway ends at midnight (PST) on Friday, March 28, 2014. Don’t wait! The Fine Print: Participation is optional. No purchase is necessary to participate. Available to US participants only. There will be one winner. Winner will be randomly selected. I will email the winner between Saturday, March 29 – Sunday, March 30. The winner will have 72 hours to respond and provide me with shipping information so I can mail them their prize! If the winner does not respond within 72 hours, the winner forfeits the prize and another winner will randomly be selected (in which case the new winner will be notified and the same terms apply). The winner will be announced on this blog once eligibility has been confirmed. 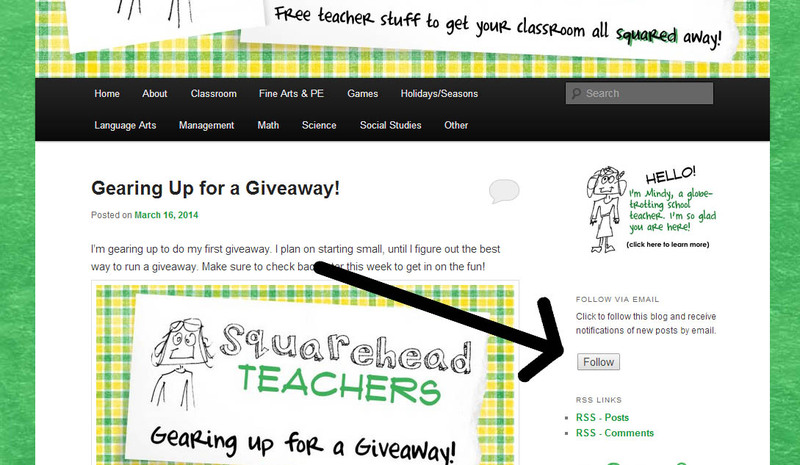 This giveaway is solely sponsored by Squarehead Teachers and is not affiliated with WordPress or any other sponsor. If you have additional questions, please contact me! This entry was posted in Books, Uncategorized and tagged books, Children, Education, Elementary School, Giveaway!, Homeschool, Kids, Teacher Resources, Teachers, Teaching by Squarehead Teachers. Bookmark the permalink.